My visit to Sanbongi Elementary School in Miyagi Prefecture was unique among the 13 schools in that computer technology was used to teach about the Friendship Dolls. 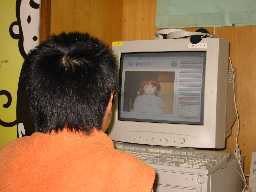 I participated in a meeting in the school's computer room with 25 students in the third-grade class of Ms. Kuniko Chiba. 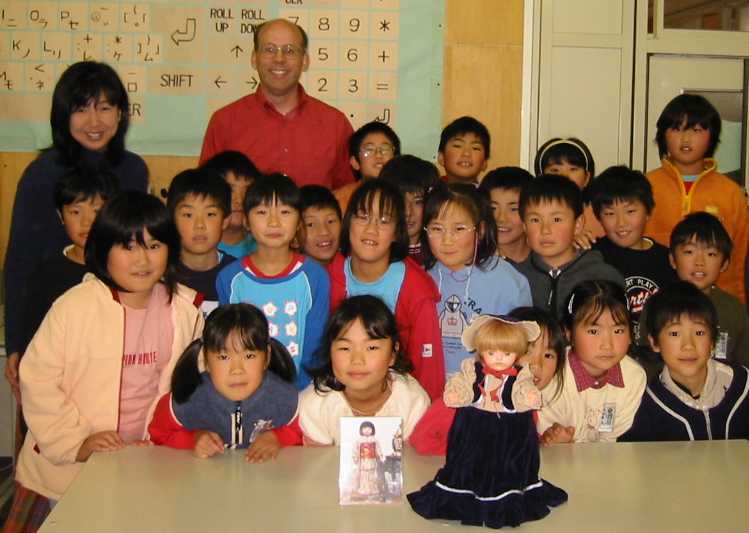 Mr. Hiroyoshi Matsuura, the team teacher at Sanbongi, began by explaining briefly the history of the Blue-eyed Doll at their school and then asking the students how they felt toward the doll. I was a little bit surprised when several said they were afraid of the doll, maybe because it was the first time they saw the doll up close and because it looked so different than them. 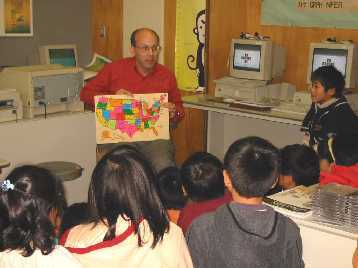 The students on their own PCs followed Mr. Matsuura as he went over the school's web page on Betty Jane, the Blue-eyed Doll received by the school from America in 1927. The students then briefly looked at the English translation I had done of the same web page. 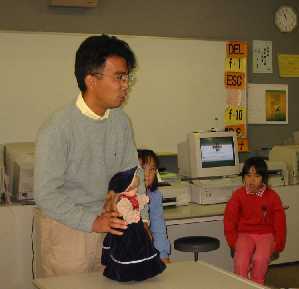 Mr. Matsuura then introduced to the students the PC-based material on the Friendship Dolls, which he had developed about five years ago. This material contained photos, a script, and sound about Miyagi Prefecture's Blue-eyed Dolls and about the history of the Friendship Dolls. The children could click the mouse to choose items from various menus, and they used earphones to hear the commentary. However, that day there were some problems with the PC server, so Mr. Matsuura had to lead the students together through the material, which they were able to watch and hear at their own PCs. The PC-based material contains about 30 to 40 separate pages with the contents organized by various menus. At the time Mr. Matsuura created the material, only four Blue-eyed Dolls had been found in Miyagi Prefecture, and now that number has increased to eight. Thank you very much for giving this beautiful Torei Ningyo in 1927. Miss Miyagi came from Japan to Kansas in 1928 as a Japanese-American Friendship Ambassador. Even now she delights American children. From last year to this year Miss Hyogo and Miss Miyagi were shown as sisters at a special exhibit at a museum in Missouri, the state next to Kansas. The American Blue-eyed Dolls and the Japanese Torei Ningyo are precious symbols of friendship and peace. We want to always take good care of Miss Miyagi. After I talked about America, the students asked me many questions about the favorite foods, games, TV programs, stars, and sports of American children. Mr. Matsuura asked me why I am so interested in the Blue-eyed Dolls. I explained that in general I really have no interest in dolls. Instead, my reasons for doing a web site on Friendship Dolls are my interests in Japanese history, the Japanese language, the Internet, and web site construction. Finally, and most importantly, I find Friendship Dolls to be a good way to make friends with many Japanese people. During lunch the principal explained that the school was founded in 1872 and now has about 450 students, although in the past it had as many as 1,000. The photos of past principals since 1872 gave me a real sense of the long history of the school. Several items and newspaper articles related to Betty Jane, the school's Blue-eyed Doll, were shown to me. The doll has three complete set of clothes, two new sets and one original set. Mr. Matsuura gave me copies of several old newspaper articles about Betty Jane, and Ms. Chiba gave me a beautiful dyed furoshiki (wrapping cloth). As I left the school building, I was surprised to see all of Ms. Chiba's 25 students gathered outside to say goodbye to me. I shook hands with each child, and I was a little sad as I waved goodbye to the children.